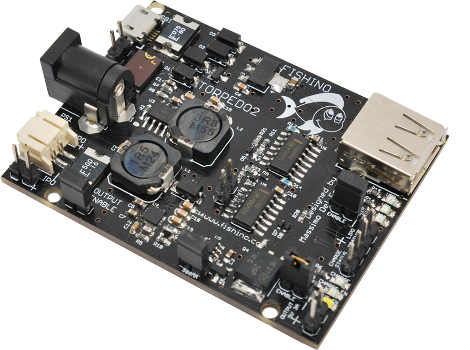 Torpedo2 is An universal switching power supply for Fishino/Arduino boards and other 5 Volt appliances. It brings UPS supply to your Fishino/Arduino boards. It's the successor of our Torpedo breakout, extending output current up to 3 Ampere. A single cell LiPo battery input, with on-board charger, allows uninterrupted power supply for your Fishino/Arduino boards. A pass-through USB connector allows powering of current-hungry USB devices even if your USB host doesn’t have enough capabilities. Can be powered externally with a wide voltage range, from 7 Volts up to more than 16 Volts. Torpedo2 has a 5 Volts standard output, both over the female USB and the screw connectors. Torpedo uses switching technology with a conversion efficiency from about 80% up to 95%, allowing long lasting battery operation.